[188 Pages Report] The global industrial starch market is projected to grow from USD 72.51 billion in 2016 to USD 106.64 billion by 2022, at a CAGR of 6.64% during the forecast period. Starch is a homopolysaccharide formed by glucose units and stored in the form of carbohydrates in plants. It is synthesized by parts of vegetable cells and is stored in seeds, tubers, and roots. Starch derived from sources in its original form is known as native starch; whereas, starch produced by physically, chemically, or enzymatically, treating native starch to change its properties and enhance its performance according to various applications is known as modified starch. Modified starch can be termed as an additive prepared by treating native starch or starch granules with chemicals and enzymes to partially degrade the starch. Derivatives are products obtained by reacting starch with a chemical compound, resulting in unique physical and functional properties. 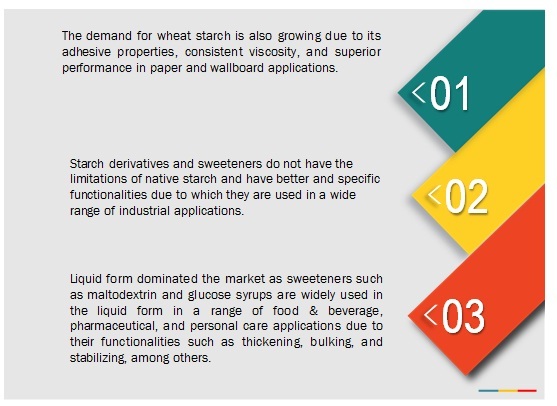 The scope of the industrial starch market for this report includes native starch and starch derivatives & sweeteners. The base year considered for the study is 2015, and the forecast has been provided for the period between 2016 and 2022. Starch and starch derivatives have various functional characteristics including thickeners, stabilizers, sizing, fat replacers, and binding in various food and non-food applications. In addition, starch derivatives are used as an effective fermentation base for the bulk production of various biotechnological products such as organic acids, antibiotics, vitamins, and hormones. Although the food industry is projected to be the largest end user of starch and its derivatives, it is also increasingly used in various other end-use applications, such as paper, building materials, cosmetics, and pharmaceuticals. In addition, native starch is useful in a wide range of applications. However, it is restricted in some applications such as paper, building materials, cosmetics, and pharmaceuticals due to its structure. Modified starches, owing to their water absorbing and bulking agent features, improve the customer experience and offers enhanced mouthfeel in various food products. Due to these factors, it remains a preferred alternative for fats among manufacturers. In addition, various functional properties of starch and starch derivatives used in a range of end-use industries are driving the demand for industrial starch. To define, segment, and forecast the size of the industrial starch market on the basis of source, form, application, type, function, and region. To project the market size, in terms of value (USD million) and volume (KT) for each of the segments, namely, source, form, type, and application. To forecast the size of the global market and its various submarkets with respect to four main regions, namely, North America, Asia-Pacific, Europe, and the Rest of the World (RoW). To provide detailed information about crucial factors that are influencing the growth of the market (drivers, restraints, opportunities, industry-specific challenges). To strategically analyze micromarkets with respect to individual growth trends, future prospects, and their contribution to the total market. To strategically profile key players and comprehensively analyze their market share and core competencies. To analyze competitive developments such as expansions, mergers & acquisitions, new product launches, and joint ventures & agreements in the industrial starch market. 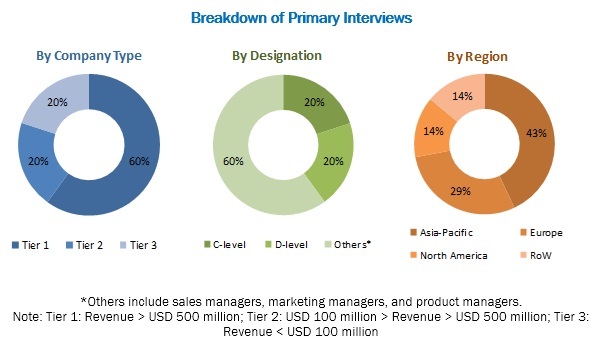 During this research study, major players operating in the industrial starch market in various regions were identified, and their offerings, regional presence, and distribution channels were analyzed through in-depth discussions. Top-down and bottom-up approaches were used to determine the overall market size. Sizes of the other individual markets were estimated using percentage splits obtained through secondary sources, such as Hoovers, Bloomberg BusinessWeek, and Factiva, along with primary respondents. The entire procedure includes the study of the annual and financial reports of the top market players and extensive interviews with industry experts such as CEOs, VPs, directors, and marketing executives for key insights (both qualitative and quantitative) pertaining to the market. The figure below shows the breakdown of the primaries on the basis of the company type, designation, and region considered during the research study. The contributors involved in the value chain of industrial starch include industrial starch manufacturers such as Cargill (US), Archer Daniels Midland Company (US), Ingredion Incorporated (US), and Tate & Lyle PLC (UK); government bodies & regulatory associations such as the USDA (United States Department of Agriculture), the FDA (Food and Drug Administration), and the EFSA (European Food Safety Authority); and end uses such as food, feed, pharmaceutical, cosmetics, and corrugation & paper making. In August 2016, Ingredion, Incorporated (US) acquired the rice starch and rice flour business of Sun Flour Industry Co, Ltd. (Thailand) to support the company’s global strategy of increasing its high-value specialty ingredients business. In July 2016, Archer Daniels Midland Company (US) expanded its portfolio of starches by introducing a new line of starch–DM Confectionery Molding Starch. This is projected to help the company in expanding its customer base in the confectionery industry. In January 2016, Cargill, Incorporated (US) set up a new corn milling plant in Davangere, Karnataka (India), which cost the company nearly USD 100 million. This helped the company in meeting with the growing demands for modified starch and its derivatives in the food and pharmaceutical industries. What are the new application areas, which the industrial starch companies are exploring? Regulations pertaining to each of the starch or starch derivatives across regions/countries. The global industrial starch market is projected to grow from USD 72.51 billion in 2016 to USD 106.64 billion by 2022, at a CAGR of 6.64% during the forecast period. The increasing demand for convenience food and multiple functionalities of starch, starch derivatives, and sweeteners in a diverse range of end-use industries are the key factors driving the growth of this market. Starch is a carbohydrate that is extracted from agricultural raw materials, such as corn, wheat, potato, and cassava and is used in numerous food and non-food applications. It is used as a major ingredient in food & beverage, feed, and other end-user industries such as corrugating & paper making, textile, pharmaceutical, personal care, and construction & building materials due to various functionalities such as thickening, binding, sizing, film forming, coating, and stabilizing. Starch is divided into three types, namely, native starch and starch derivatives & sweeteners. The industrial starch market is segmented on the basis of type, into native starch and starch derivatives & sweeteners. The market for starch derivatives & sweeteners is projected to grow at the highest CAGR between 2016 and 2022. Unlike native starch, starch derivatives and sweeteners have better and application specific functionalities, due to which they are used in a wide range of industrial applications. The industrial starch market in Asia-Pacific is projected to be the largest market during the forecast period. The market in Asia-Pacific is driven by the use of starch in various applications in emerging Asian markets such as China and India. For instance, the consumption of starch in China is nearly half of the global starch consumption. Starch and its derivatives find application in various food applications such as confectionery, processed food, beverages, and others. Native starches are generally used for providing food products the required consistency, texture, and stability. However, these starches are chemically treated to create modified starches for application in a range of food products. Modified starches find increasing applications in food systems, where native starches have not been able to deliver the desired performance. In comparison to the food and non-food markets for starch, the feed market for starch is relatively small. While modified and native starches are used as thickeners and binders in feed, other starch derivatives act as a source of fiber and for coloring and sweetening applications in pet food. Pregelatinized and high-amylose starch has useful binding properties and is used in pelletizing and extrusion processes. The use of starch derivatives remains high as it provides features such as enhanced digestibility of feed and protecting the liver functions of livestock. Besides food and feed industries, the starch, its derivatives, and sweeteners find application in various other industries such as corrugation & paper making, pharmaceutical, textile, cosmetics, mining & drilling, construction & building materials, and chemical. The use of starch in these industrial applications is based on the need for specific functionality and properties among final products. What are the upcoming industry applications for industrial starch? High R&D costs associated with the extraction and manufacture of starch derivatives are restraining the market growth. The extraction of starch derivatives from new natural sources for physical and chemical applications in various industries, such as food & beverage, paper, and pharmaceutical has become a challenge for manufacturers. Further, advancements in research have resulted in clinical recommendations with regards to the safe use of starch derivatives in various industrial applications. The use of starch in processed and convenience foods can contribute positively to the health and wellness of the general population in terms of fat substitution and replacing synthetic additives such as emulsifiers. Starch derivatives and their benefits have gained recognition in Europe and North America; hence, manufacturers and marketers are producing and distributing a wide range of starch derivatives & sweeteners for food and non-food applications, with an increased emphasis on the R&D activities. However, more investments are required to support the R&D activities, restraining the growth of this market. The key players in this market are Cargill, Incorporated (US), Archer Daniels Midland Company (US), Ingredion Incorporated (US), Tate & Lyle PLC (UK), Agrana Beteiligungs-AG (Austria), Grain Processing Corporation (US), Roquette Frères (France), Tereos Group (France), Royal Cosun (Netherlands), and Altia Industrial Services (Finland). These companies have predominantly adopted new product launches as a growth strategy. In addition, other strategies adopted by these companies include expansions & investments, mergers & acquisitions, and joint ventures & agreements to increase their market share.